In his December post, Bill Troy, ASQ CEO, asks “Is Quality Ambitious Enough?” He highlights an article by longtime ASQ Member Brooks Carder. 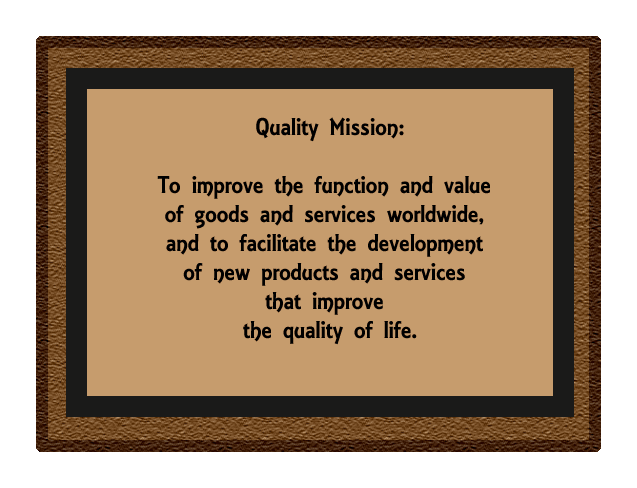 Mr. Carder suggests an expanded mission statement for the American Society of Quality (ASQ). This statement elaborates on the significant impact quality professionals have on the quality of life by contributing to improved products and services. To improve the function and value of goods and services worldwide, and to facilitate the development of new products and services that improve the quality of life. This statement is so encouraging and inspiring to the quality professional. It says you are here to improve the quality of life. In my role at a textile company years ago, I was a “nerd engineer” in the trenches following product test result trends. In communication with customers, I compared their test results to ours with great discussion of variation and specifications. The statement particularly of improving the quality of life relates directly to my customer who was manufacturing garments from the textiles. Deviations outside acceptable limits created havoc with production schedules, and claim investigation expenses would add up. It could be a discouraging situation. It certainly had a negative effect on quality of life. Mr. Carder’s statement could have lent some inspiration to a tough day. A statement like Mr. Carder’s could be used in quality meetings and day-to-day discussion to keep focus on customer satisfaction and to encourage quality professionals. It could be posted around the workplace for inspiration. Being a good example to other quality professionals goes a long way in encouraging others. Traits like patience, persistence, thoroughness, and positive attitude not only benefit the workplace, but encourage other professionals as well as your coworkers in the quality field. Mr. Carder also suggests more outreach and promotion to increase numbers in the quality “religion.” Certainly it is a challenge to spread the quality message, but, like any message, new tools of social media are an option. Messages about poor quality products are spread quickly on social media and website reviews. Consumers are interested in quality and make purchase decisions daily based on product quality feedback on the internet. Dependent upon your situation, perhaps messages about quality projects, quality improvements, quality training, or quality challenges could be topics for your company’s social media channels. Advertising on this blog supports my writing. By clicking an ad, you are under no obligation to buy. If you see an advertisement of interest, please click.